A Foodie Bibliophile in Wanderlust: Happy National Ice Cream Day! If you're new to the blog, you might not know that I am obsessed with ice cream. But I'm not just a typical vanilla or chocolate girl. No, they have to be unusual flavors like olive oil or maple bacon. Needless to say, I can't let a day like National Ice Cream Day go by without sharing my love of frozen dairy treats with you, dear readers. So are you tired of the same old chocolate and vanilla ice cream? Need some ideas for how to celebrate National Ice Cream Day? I got you covered. 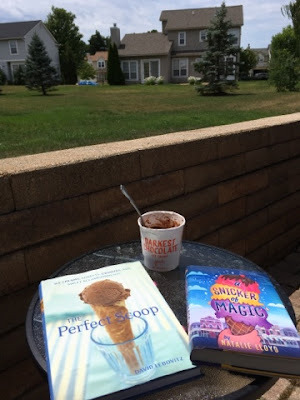 The Perfect Scoop, a pint of Jeni's, and A Snicker of Magic. How are YOU celebration National Ice Cream Day? Or, if you'd rather not make your own ice cream, buy some Jeni's Splendid Ice Cream from your local grocery store, online or one of their scoop shops. And since I'm always seeking out weird and wonderful ice cream flavors, please share with me your favorite places to get ice cream and what flavors I should try there.